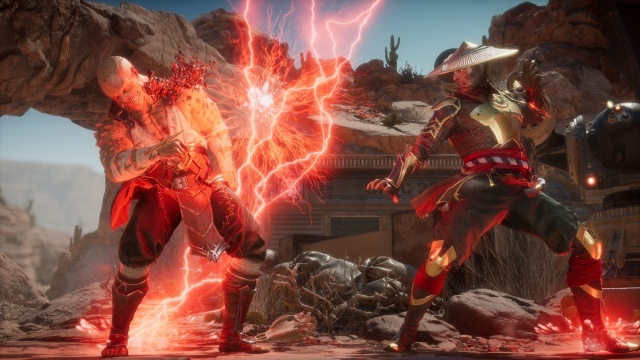 The Mortal Kombat 11 beta has been live now for about a week and I had the chance to get in a few games on it and I'm quite impressed with the way the game is coming along so far. Unlike the constant rushdown gameplay of MKX, MK11 gets rid of the dash command and slows down the overall mobility during fights. This makes it so players have to earn their way into another character's personal space much more carefully. The spacing in MK11 is much more important this time around. The combos seem to have been shortened as well, but they can still get long and quite damaging depending on the character chosen. Speaking of characters, the beta has five selectable fighters ' Jade, Kabal, Scorpion, Skarlet, and Baraka. I'm not really a fan of any of the available fighters, but I do find all of them fun to mess around with. There was no fighter that I felt was lacking. Jade's the most unique out of the available fighters with her mid-range type of gameplay. I mainly stuck with Baraka because of his heavy damage with only short combos. Each fighter has three standard variations and you can also customize moves by assigning a certain number of them to your fighter from the kustomize menu. There are some moves that are only available through the kustomize menu. It will be interesting to see how Netherrealm handles the character customization for tournaments and online ranked matches. The game has a defense and attack meter that have two bars each that start out full and slowly refill on their own as you use them. The defense meter is used to pick up environmental objects to attack your opponent and the attack meter is used to meter burn (power up) special moves to give them extra properties such as sending an opponent into the air for juggling. The X-ray super attack has been replaced with a Fatal Blow that can only be done when a character is at around 35% health. The Fatal Blow is a super-damaging attack that takes around 1/3 of a character's health bar. At this stage, I really feel the Fatal Blows should have some sort of negative to doing them ' even the recovery time is often too fast to punish. Fatal Blows are limited to once per round. There are also Crushing Blows with some moves that seem to happen once ever certain amount of times ' these can make moves take more damage or give them different properties. In regards to online, the netcode is extremely good so far. You can see your opponent's connection status, their ping and if they are connected wirelessly or through a wired connection all before accepting a fight. Fantastic! The only problems that I had with online were some slight hiccups because of a wireless connection from my opponent, but this didn't seem to affect the actual gameplay very much ' just a pause during gameplay at times. The online plays just like playing in offline mode for the most part. The developers had a single player set of ladder matches to try out and the online play felt no different than playing the offline single player during my matches when I got a wired connection ' two wired connections are smooth as silk. Wireless connections had a VERY slight delay but were still easily playable and hardly noticeable. I had to play a wired connection opponent to realize that wireless opponents had some slight delay.